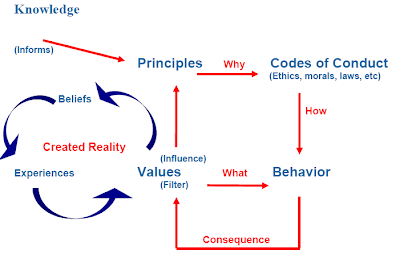 Minessence Values Framework [MVF] Knowledge-Base: How can I change my world-view and leadership style? How can I change my world-view and leadership style? Make sure you have effective strategies in place to have your foundation values met. It is important that they are a foundation, not an Achilles’ heel. Taking on ever more challenging activities, and gaining the skills to be competent with them, will impact on your world-view, and hence, leadership style. Of particular importance are those activities which require interpersonal, imaginal and system skills. To move to a new paradigm (world-view) you have to fully embrace the language of that paradigm. So, if you see people as human-beings and not as cogs in a machine, you must refer to them as something other than your most valuable "assets" - you could not be a human "resource" manager, you would have to, say, be a human "relationship" manager. Thus, attention to linguistics is part of the answer.